This is Crystal Cryst-a-Wick Fairy a digital image from the Lacy Sunshine Shoppe. I thought she was just the prettiest little fairy to use for the new theme Things with Wings, at the Come And Get challenge It that begins tomorrow. Lacy Sunshine is our sponsor for this challenge and her shop carries such a large variety of images to choose from. I hope you'll come and share your creations with us, you may be the lucky one this week to win 3 images from her shop. This is Marjoram, she has such a sweet happy face. A digital image from Little Miss Muffet stamps, they have such a huge collection of some really cute characters, wish they had more digis. Colored with Copics, layered to an embossed blue"brick" wall, adding many die cuts and even used an old punch. End of summer beginning of Fall, because the temps get sooooo much cooler. This is Lupita, just one of my favorite Lacy Sunshine images, there are so very many of them. Colored with Copics, upper butterflies are die cuts, lower butterfly is an EK Success punch. She's sitting contemplating the end of summer, thankful the heat is coming to an end school is beginning and Fall her favorite season it about to begin with it's own magical colors. A new challenge begins today at the Fairy Tale Challenge Blog the theme being Clean and Simple, this is my card as a GDT member. As you can see I did keep it very clean and simple using 2 die cuts both from Memory Box, the sentiment is from my stash with 2 layers of card stock. A new challenge begins today at Come And Get It with the theme of: Anything Goes with a Sentiment. I choose to use the image of a shopping bag with Shop Till You Drop, this is a QKR Stampede image. QKR Stampede is our sponsor this week and you can find a lovely selection of their images HERE. I hope you'll come and join us to share your creations. 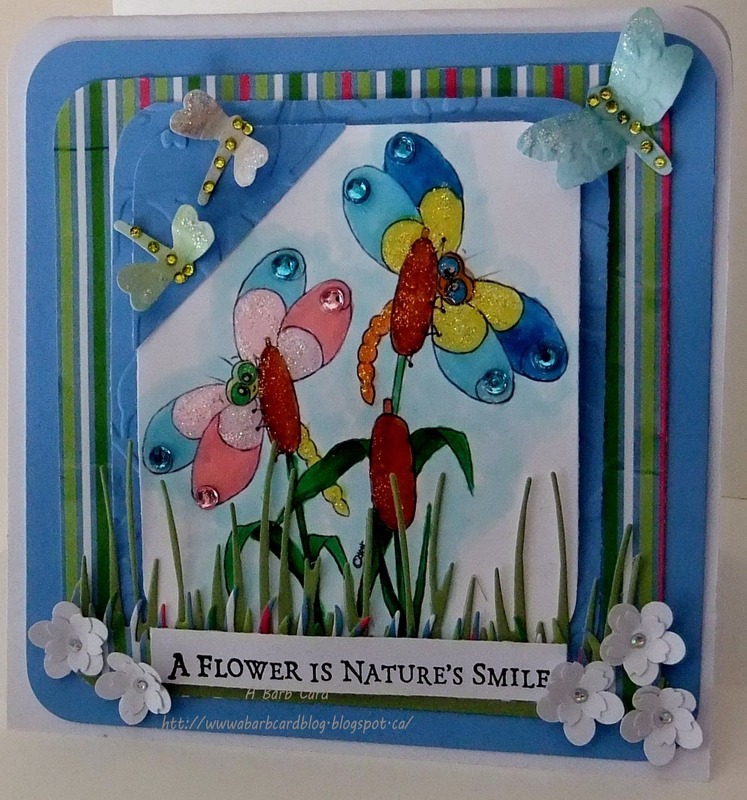 This image is from Digis Stamp 4 Joy, the challenge this week is circles and this is what I came up with. I punched 2 large circles with an old punch then punched 2 smaller circles into the large ones, and 2 more circles. The dark background was something I made playing with spray inks and such a long time ago and finally found a use for it. A new challenge begins today at the Wags N Whiskers challenge blog the theme being Back To School/Something for the Teacher. 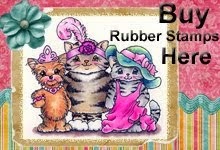 Here is where you can purchase Wags N Whiskers digis if you are looking for rubber stamps you'll find them here. You are not required to use a Wag N Whiskers image but if you do your name goes into a second draw. For my DT card I choose to use Budding Artists, this has been a favorite of mine for a long time. I hope you'll come over and share your creations with us and who knows you maybe the lucky winner this time. A new challenge begins today at the Brown Sugar Challenge Blog, the theme is "Let's get Krafty" meaning you must use kraft paper or card stock in you project. Lacy Sunshine is the sponsor for this challenge and her shop is filled with lots of wonderful characters to choose from. 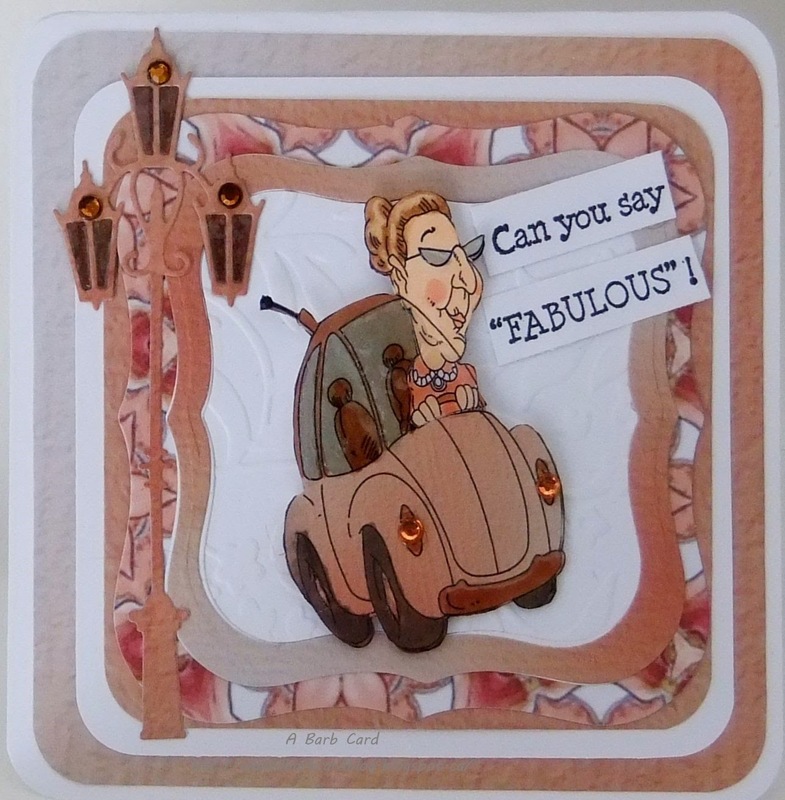 I chose Rory - Time to Color for my first DT card at the Brown Sugar Challenge Blog. I've just become part of their team and looking forward to making more DT cards to post there. She is just one of my favorite Lacy Sunshine characters and I love her hat. I hope you'll come by and share your creations with us and you may be one of the lucky winners. This is my DT card for the new challenge at Crafting for all Seasons and this week is Monochrome. I hope you'll come over and share your creations with us. 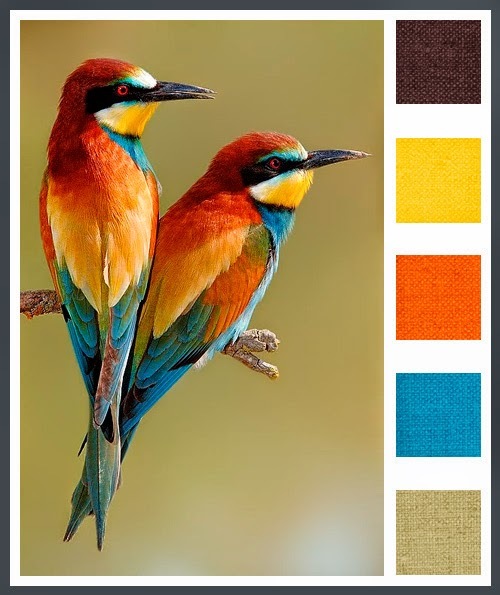 Stitchy Bear's Digi Outlet is our host for this challenge and they have over 4,500 images from various artists to choose from. You will also find digi papers and paper packs. I chose Driver's ED to use on my card, who could resist that and she's driving my favorite car face. This is Polka Dot Pal Rosalie she usually comes with 2 dots for eyes but now Little Miss Muffet Stamps has come out with an image (rubber and digi) of various facial expressions that you are able to fit Polka Dot Pals with eyes, noses, eye glasses and mouths. She is sitting on Border Zen Tangled Arch and you can find all of these images HERE . 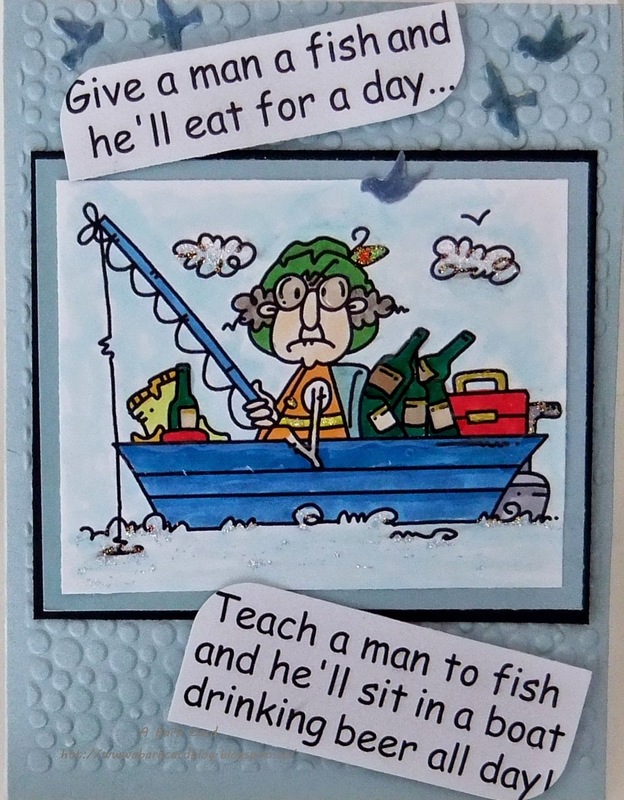 This is my card for the new challenge at Come And Get It and the theme this week is Fishing. 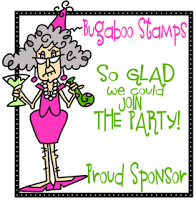 Our sponsor for this challenge is Bugaboo Stamps, they have a wonderful selection of images to choose from, well worth your visit. I chose to use Gus Fishing as the image for my card, I can't help but chuckle when I look at that face as well as the sentiment. I hope you'll come join us and share your creations, you may be the lucky winner this week. 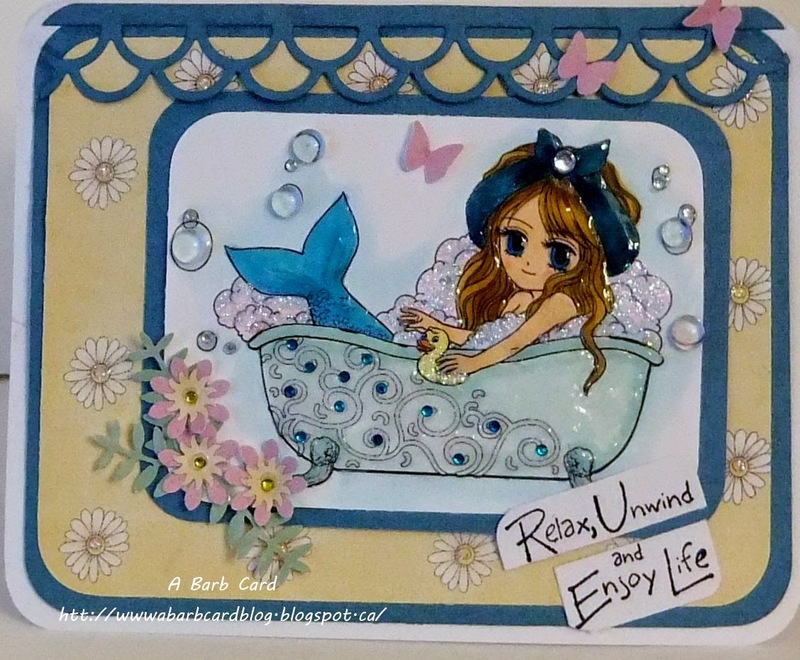 Colored with copics, Glossy Accents, Stickles and die cut birds were used to put this one together. This is Mermaid from Art by Miran she has some really different and wonderful characters to choose from. 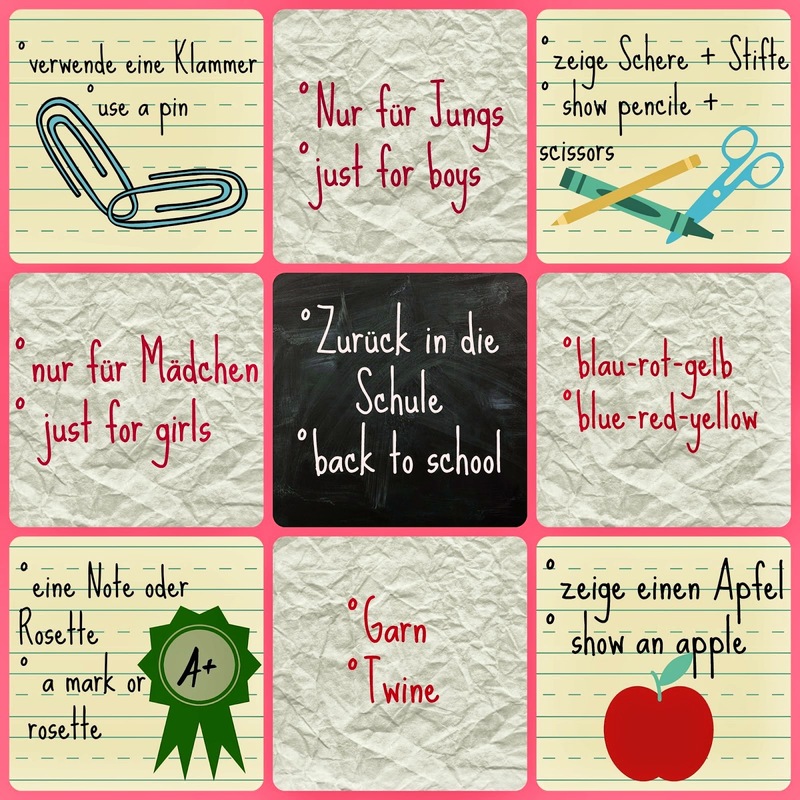 A new challenge begins at the Fairy Tale Challenge Blog today and the theme is Back to School Bingo. I hope you'll come share your creations with us. This is the bingo chart to choose 3 items to add to your card. I chose the paper clip, the "B+" and for the girls. 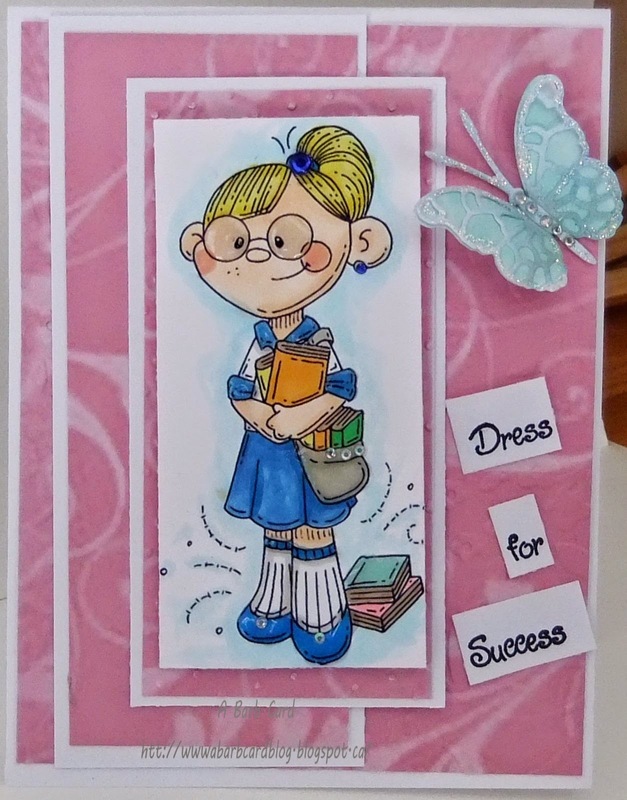 This little lady is Sandi School Days a digi from the Lacy Sunshine Shope. There is such a wonderful choice of characters to choose from well worth the visit. This is Tillie and Fiona, 2 little Polka Pals from Little Miss Muffets Stamps, they have so many adorable little characters plus much more. Their faces are normally 2 small dots for eyes (Fiona came wearing glasses) but now they have come out with 4 sets of eyes, noses and mouths plus a pair of eye glasses made to size and fit their faces, too fun. Colored with my Copics, used a few punches and a few dies for the background. The image I've used here is from Bugaboo Stamps called Boot of Flowers. Colored with Copics, die cut and punched (MS) butterflies, die cut flower, layered to embossed CS with my Cuttlebug, added Stickles, pearls, bling Glossy Accents and a sentiment from my stash. It's a new challenge with a new theme over at the Come And Get It challenge blog. I hope you'll come over and share your creativity with us. We enjoy visiting your blogs and gaining inspiration along the way. You may just be the lucky one to win this week. This week the sponsor is Meljen's Designs digital Stamps and they have a wonderful assortment to choose from. I chose to use Book Girl for my card, that look on her face is so cute and I thought fun to color. This is 4 separate PNG digital images that I assembled into a mini scene on my lap top then printed out to color. All of the images are from Digis Stamp 4 Joy, Garden Gate, Birdhouse, Selena, and What a Day (girl in blue). Colored with Copics, Glossy Accents and a little bling added with some stickles, background embossed with my new birch/brick folder form Spellbinders, sentiment is from my stash. Meet Attitude Avery a digital image from The Stamping Chef where they have a wonderful variety of images to choose from, well worth taking the time to visit. This is a new digi from Digis Stamps 4 Joy so I thought I'd play with it along with some of my bird dies. Colored with Copics, some Glossy Accents, bing, and Stickles. Meet Summer Emily Hippie, a digi from the Lacy Sunshine Shoppe. Colored with Copics, some Glossy Accents, bling, Martha Stewart border punch, a few die cuts, sentiment is from my stash and a bit of Stickles. This is my design team card for the new challenge at Wags N Whiskers that begins today with the theme being Birthdays. I chose to use Sammie's Surprise and Buddy's Balloon, they are both so cute and work well together. Both are digital images and also available in Rubber at Wags N Whiskers Stamps. I hope you'll come join us and you may be the lucky winner this time. This digital image is from the Lacy Sunshine Shoppe and named Savannah's Secret Window. Colored in Copics, layered to embossed brick cs, added a few dies, flowers and bling. It's time for a new Challenge at Crafting for all Seasons and the theme is Feature a Creature, this leaves room for a lot of your creativity in choosing your "Creature" I hope you'll come join us sharing your creations. You could be one of the lucky winners. 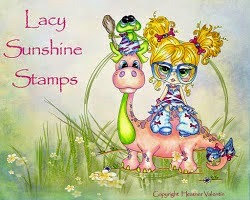 The Lacy Sunshine Shoppe is the sponsor this week and she has so many wonderful images to choose from. I love all the special characters she creates, well worth the visit there. The one I've used is Penelope_willowtwirls Hobgobbi. This is Lucy Loo Chilling at Home from The East Wind Digital Images. She is thinking of going to the BEACH, her book is about BEACHES so she thought good idea - let's go to the BEACH to read. This is Bubble Gum and Chocolate a digi given to the FB members of The East Wind group to use in a challenge and I think she is so pretty. This is Marjoram and Feline Sitting, 2 digital images from Little Miss Muffet Stamps that I thought to be adorable. I decided to give this color challenge a try, I think I pretty well used every and all the colors posted in the picture only. This is an digital image from Little Miss Muffet Stamps called Harvest Swawn. I just recently found this stamp company and oh my they do have so many wonderful images to choose from digis and rubber. This is my card for the new challenge this week at Come And Get It, the theme being Use a Die. I've actually used 4 of them, 2 for the dragon flies and 2 different ones for the grass. My image is Peek-a-boo Dragon flies, a digital image from Oak Pond Creations. Oak Pond Creations is the sponsor this week and they do have some wonderful images to choose from. I hope you come share your creations with us. This is Victorian Lizabeth an image from the Lacy Sunshine Shoppe, I've had her for quite a while so thought I'd give her some color rather than leaving her so pale looking. 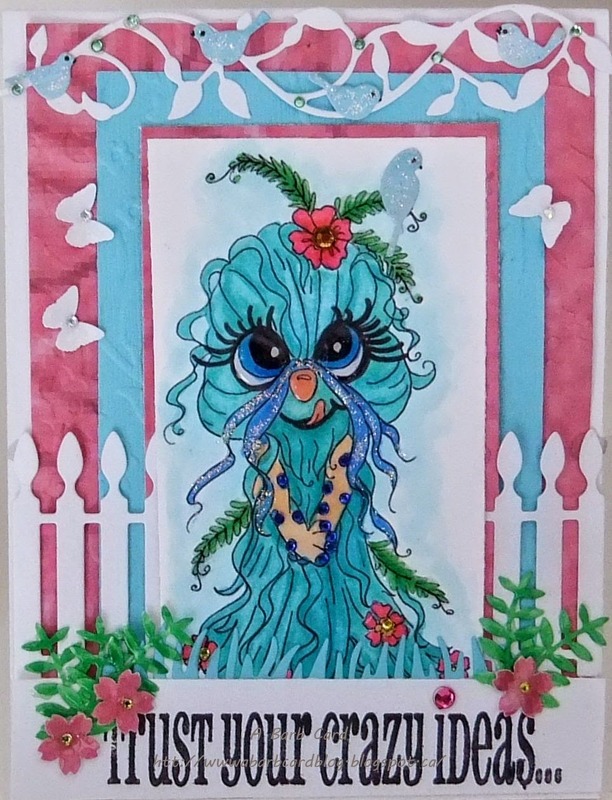 Colored with Copics, added a few die cuts, the flower pot was a tall vase from a punch so I just gave it a little cut, background paper from Stitchy Bear. A new challenge begins at the Fairy Tale Blog today with the theme Sun Beach and Sea. They have a nice prize for the winner so why not come join in, share your creations and you may be the lucky one. I've chosen to use Beach Baby from The Stamping Boutique where you'll find a large variety of images to choose from. Colored with Copics, a little Stickles added here and there for sparkle, butterflies from a Martha Stewart punch, gems, ribbon and a couple of die cuts.